Bedroom Furniture - Find Quality bedroom sets with Queen Size, King Size and Full Size Beds for your bedroom space. Looking for bedroom set ? Furniture Store NYC has large selection of all styles, types and colors bedrooms with option for king size bed, queen size bed, full size. There is 3 major styles of bedroom sets selection: contemporary/modern, transitional, or traditional bedrooms. From most popular bed finishes cherry to brown, from funky colors: blue, pink to modern finishes in white, black, gray, Furniture NYC has it all. Traditional style bedrooms with slats, sleigh, beds with drawers, in modern/contemporary style bedrooms in platform, underbed storage, upholstered beds, we hope you can find your bed set collection, that will fit your space and make your bedroom stylish, comfortable and cozy. Great Selection of Traditional, Contemporary or Modern Bedroom Sets Online by popular furniture brands, like Coaster, ESF Furniture, J&M Furniture, Global Furniture, Vig Furniture and others. Use our search navigation to quickly find your desire Bedroom Set options by Colors, Styles, or Price. For any questions Call us at (866)647-8070 or click the Chat Button. Bedroom sets are getting more and more popular due to its full proof arrangement and their cost effective nature. They are also very elegant in their looks and designs. When people think of furnishing their bedroom, they look for elegant furniture to give their bedroom an elegant look. The basic requirements of a bedroom are a comfortable bed, a dresser a mirror, a chest, and nightstands. 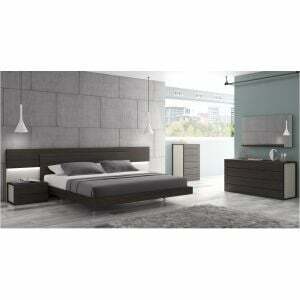 This furniture together forms the structure of the bedroom décor and gives it a complete look. Generally these are separately collected from a furniture store, accordingly to their choice of color, material, and budget. The only problem in this collection is that it has to be strictly kept in mind that the items should have symmetry in their materials and looks. But, a good solution to this problem of furnishing your home has come up in the form of room sets, available in today’s market. When you plan to furnish your bedroom, you can go for a modern bedroom set, accessible in a number of colors, styles and designs. Each of these bedroom sets is unique in their composition and layout. Bedroom sets are found in traditional, modern and contemporary styles, and with their own distinct features. The items of a modern bedroom set are a king sized or a queen sized beds, a dresser, a mirror, a chest and two night stands. The bedroom sets are a cost effective option, instead of buying these items separately. Queen Beds bring a unique and feminine look to the bedroom. One of the most popular sizes of a modern bed is the queen sized beds that are apt for two people, and fits well in a guest room. These are undoubtedly spacious. The selection of the size of a bed in a bedroom depends largely on the floor space of the room, and also the number of people to use it. Queen sized beds are very popular for a family that has more than one bedroom. It is the apt size of bed for a guest room or the room for two kids, or even smaller master bedrooms for that matter. However, if the size of the master bedroom is not big enough, then the only option before the family is to go for a queen sized bed. Queen size beds are smaller in width, and a bit less expensive than a king bed. These also look very feminine and stylish because of their dimension and shape. The frame of a queen bed is supported with a center leg, besides the normal structural support of the frame of the bed. Queen beds are available in a variety of style and designs, each of which are unique. Some of them are made of wood, while, others are made of metal. Some of the bed frames have the provision of adding headrests for additional back support while sitting on the bed. The wooden queen are the most popular ones, set up in finishes of espresso, tan, natural oak, mahogany etc. King beds are Emperor of the master bedrooms. When you are in a mood of furnishing your master bedroom, then the most important thing needed is a King bed with an elegant look and style. This enhances the beauty of your room’s décor. A comfortable bed is essential for a sound sleep at night that will keep you going throughout the day. Much of it depends on the selection of your bed. The size of your bed plays an important role in optimizing the comfort of your night’s sleep. King beds are made for the master bedroom of your home. They are large sized beds that give ample space of movement, and an increased scope to maximize comfort and relaxation. Due to their huge structure, a worry that comes to our mind is that of moving the bed at times. But this problem is overcome by the cleverness of the designs of the king beds. The large size of the king beds offer greater comfort and space, and is suitable for more than two people. The frame of king beds are supported with a center leg, apart from the normal structural frame support. The king size beds are made mostly of high quality solid wood, wood veneers, and there are also some made in metals. They offer a wide range of finishes in brushed nickel, mahogany, natural oak, antique oak, dark espresso, pine, tan etc. All these look very elegant and graceful in a modern bedroom. The frame of some of these beds has provisions for adding headrests, if needed. Dressers add life to the storage needs of a bedroom. A good dresser not only adds to the beauty of the bedroom, but also adds ample storage space for bedroom items and clothes. It is one of the main items of a bedroom set. When you are thinking of furnishing your bedroom with modern furniture, don’t forget the importance of an elegant dresser in your room. An amazing dresser will change the ambiance of the bedroom, by providing storage space for the folded clothes, and small sized dress accessories like, socks, hats, handkerchief etc. Dressers form an indispensible part of a contemporary bedroom set and are very important for the room. Dressers are available in a wide range of designs and styles. They may be a single dresser or a double dresser. They come in traditional, modern or a fully contemporary in style. All of them are fine enough, but the selection has to be done based on the style of the bedroom decor. 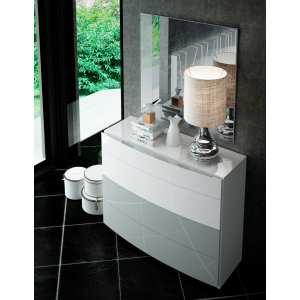 Some of the dressers are fixed with mirrors, and does not leave any space for another mirror in the room. 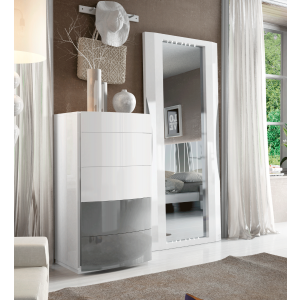 These mirror fitted dressers are very good looking, and will brighten your room and will turn it into more stylish. On the other hand, dressers without mirror fittings look elegant, but needs to be supplemented with an additional mirror placed on top of it, for convenience. Dressers are made of wood, veneers or metals. All of them are stylish, but the wooden dressers are more popular. This offers a variety of finishes in antique oak, mahogany, cherry, espresso, gray, tan, brushed nickel and many more. Mirrors give magical effects to the ambiance of a bedroom. The basic nature of a mirror is to create an illusion to make a room look larger and brighter in size. They are a valuable item in the décor of a bedroom. A good looking mirror adds to the inherent beauty of a bedroom and changes the total ambiance of the place. Mirrors make a bedroom look bright and larger than they actually are. 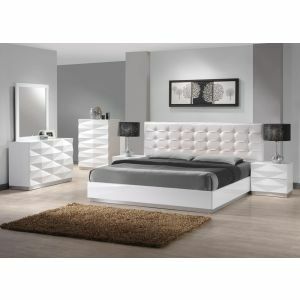 Mirror is one of the most wanted items of a modern bedroom set. A well designed mirror has an appeal that makes the bedroom more attractive and magical. Mirrors may be floor mirror type, or of a smaller type to be hanged on the wall or placed on top of a dresser. A floor mirror is very useful for morning dressing. The other types of mirrors are, Cheval and traditional. A cheval mirror spins to adjust the viewing angle, and come with an elegant antique base. On the other hand, traditional mirrors are antique looking pieces that have intricately designed frames with carved motifs. They are among the most attractive mirrors. The shape of the mirrors differs to a large extent. Most of them are found in a square, round, oval and rectangular shape. The traditional mirrors were mainly made with wooden and metal frames, but, today modern mirrors are also found with glass frames. These are offered in the finishing of espresso, mahogany, brushed nickel, cherry, antique and gold colors. Nightstands are the most helpful items in the darkness of night. Nightstands are one of the main items of a modern bedroom set that adds beauty to the bedroom décor, and are also very useful items during the nights. Modern families often opt for bedroom sets for their homes, rather than buying all the furniture pieces separately. These bedroom sets are provided with two classy nightstands that make the room look all the more exclusive and classy. But, if the bedroom furniture is purchased separately, then it should always kept in mind that nightstands give the finishing touch to a contemporary bedroom. So, one should not overlook the importance of two nightstands in making the décor of their bedroom complete. Nightstands are generally placed besides the two sides of the bed. No master bedroom suite looks elegant and full proof without a pair of classy nightstands. They serve as the perfect place to keep things like, books, reading glasses, night lamps, drinking water bottles etc. They are offered in various types like, antique, traditional, transitional, shakers and contemporary. All of them have unique features that make them different from others. Most popular nightstands are made of wood and offer a wide range of finishes like, espresso, antique oak, mahogany, maple cherry etc. They are also available in metals with finishes of gold and brushed nickel. Nightstands may have up to three drawers. Some of them also offer an open and covered storage space at the same time. Chests are additional storage solutions for a modern bedroom. Chests form an optional item in a contemporary bedroom set. It is an organized series of drawers in the form of a smart furniture item of a bedroom. They come with multiple utilities. 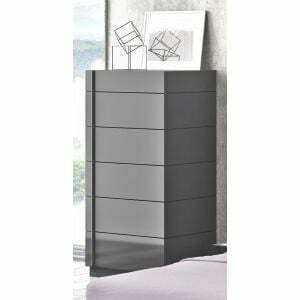 Chests are amazing storage solution for a modern bedroom which is having a regular dresser. A chest provides ample space to store bedroom items, and also helps in concealing unfolded clothes in times of emergency. Chests are typically taller and narrower than a standard dresser. It has become a common style to use both the items in a modern bedroom. This is because a family needs a lot of storage space in the bedroom which is not always fulfilled by dresser alone. The number of drawers varies largely from three to nine drawers or more. But, chests with six drawers are common and popular among many. 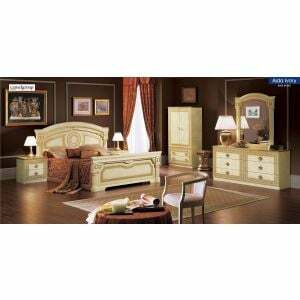 The various types of chests are bachelor chest, media chest, lingerie chests, corner chests, changing tables etc. They are basically made from wood and metals of different kinds. They offer finishes in Antique, natural oak, maple, and espresso, tan white, black, gray, gold and brushed nickel. These chests are of traditional, modern or contemporary styles, and are very elegant. The choice of chests in your room should be guided by the style of the décor of your room, and the color and finish of your other bedroom items. These will significantly enhance the storage capabilities in your room. Armoires are made for an overcrowded bedroom. One of the new innovations of bedroom furniture is an armoire which gives an amicable solution to the storage problem of an overcrowded bedroom. It makes your room beautiful. Armoires are basically used to get additional storage space when the regular storage items of storage like dresser and chest fall short to suffice the needs of the family. Armoires are very well designed and are available in various types like, computer armoire, wardrobe armoire, TV armoire etc. TV armoires are specially designed to accommodate the entertain center of your home, while the wardrobe armoires are made for the storage purpose in your bedroom. Computer armoires make place for your computer and allied appliances. The modern designed armoires are made with flat panel doors to suit the space scarcity needs, while the traditional armoires have raised panel doors made of wood. An armoire gives a neat and organized look to your room, and hence adds to the closely controlled appearance of items in the room. They are found in colors like black, white, mahogany, espresso and many more. The white armoires are best choice for those families which goes after the scruffy fashionable look. You may go for bead board detailing or louvered doors for emphasizing the look of the armoire. Even if you want an armoire of a smaller size for storing your jewelries, then you can buy a modern jewelry armoire for yourself. Leather is one of the favorite choices of many when it comes to upholstery product. It is known for its durability and elegance. In bed a leather headboard look so graceful especially when match with an upholstered modern platform. If you prefer to get a bed with leather headboards that would be a perfect choice. Bed with leather headboards comes in variety of style, color and design. Grey, white, brown and black are among of the best seller of this product. It also looks great with any type of platform bed. Leather products have many advantages among other products, aside from being durable and elegant, it can be cleaned easily using soap and water. If you decided to purchase a bedroom set, try to take a look at the bed with leather headboard, this might be what you are looking for. When buying always keep in mind that quality is important. Although, the price of good quality product is a little bit higher than ordinary product but in the long run it is much cheaper because it will last long than the latter.